The United Arts of Central Florida announces this years upcoming ArtsFest. There are 220 events in 81 venues across 4 counties! Maitland and Winter Park are prominantly featured, with events at venues such as the Albin Polasek Museum & Sculpture Gardens, Creadle School of Art, Enzian Theater, and the Maitland Art Center & Historical Museums…to name a few. 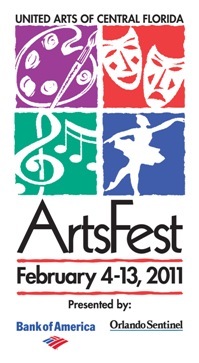 This years ArtsFest runs from February 4-13…all arts, all week, all FREE!!! All Orange County venues are just a short distance from Thurston House, our Central Florida Bed & Breakast Inn. Book your room now, and enjoy the arts!